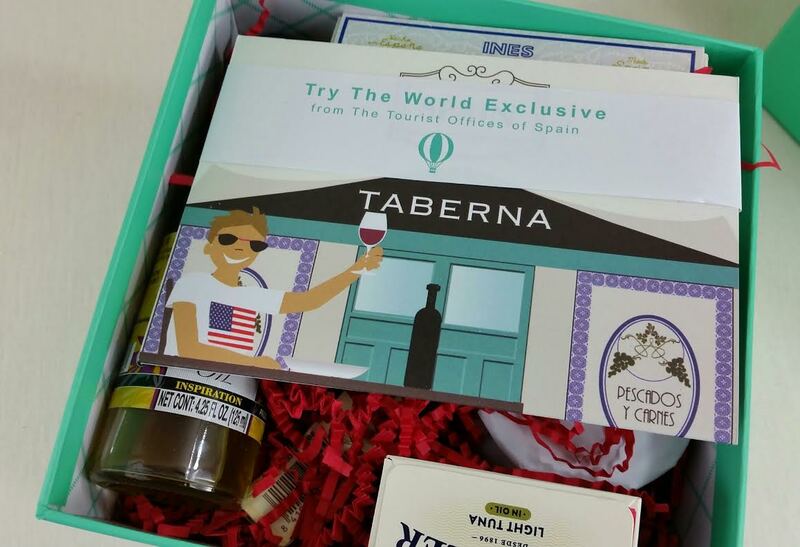 Try the World is a bi-monthly subscription box that sends gourmet cuisine from designated areas around the world. This review is for the Spain box which is the box you will start with when you subscribe. 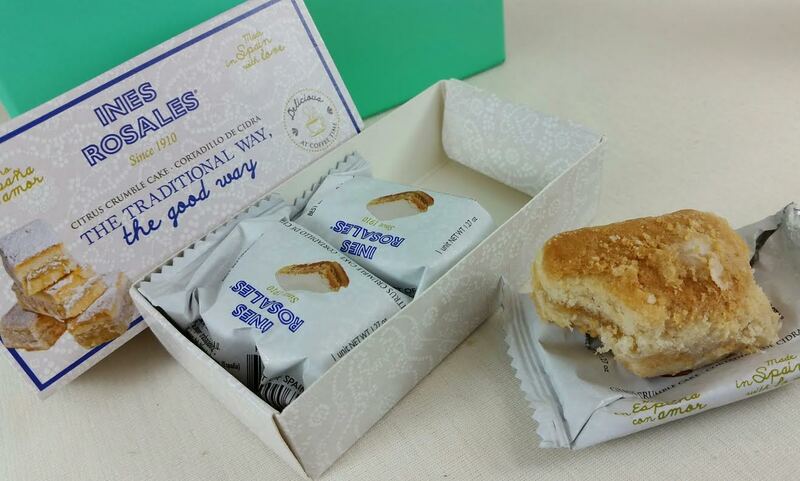 Each box is curated by a celebrity chef with knowledge of the area who shares his recipes. The featured chef for this box is Jaime Bissonnette, a 2014 James Beard Award winner and chef-owner of Copa and Toro in Boston and New York. 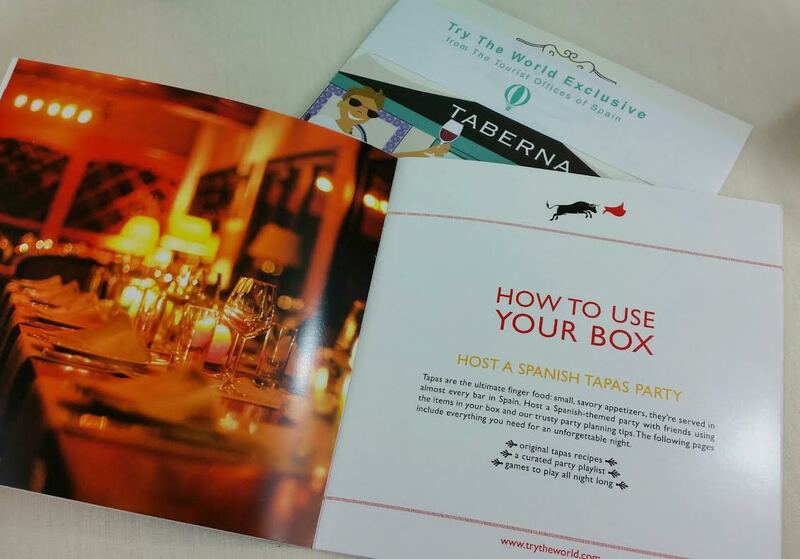 He is apparently a tapas expert and the Spain box contains products to help you make the best tapas ever. 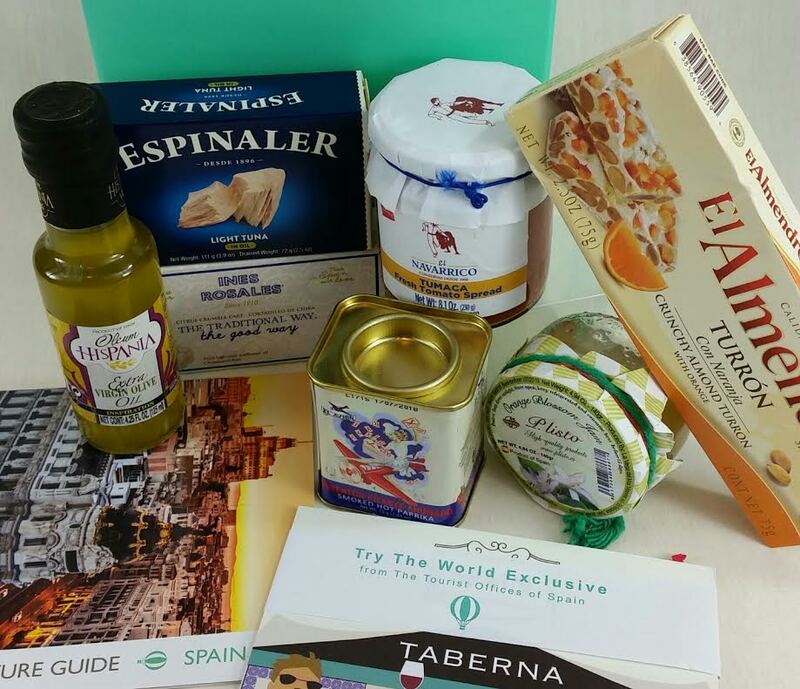 What You Get: A collection of delicious gourmet foods that are most representative of the featured country’s cuisine. You'll also receive a culture guide highlighting the rich cultural heritage of each country and product card that explain how to use the items in your box. Try the World includes a Culture guide that has recipes for the products included, things to see when you are in Span and they've also arranged a Tapas Night playlist on Spotify to accompany your party. Oleum Hispania Extra Virgin Olive Oil- This olive oil is from Cordoba, a region famous for it's high quality olive oil. P. Listo Floral Jams- Preserves that can be served on toast or presented with cheese or tea. This one is made with orange blossoms. I don't think I've ever had a jam quite like it. P. Listo is a family company and they grow their jam ingredients on their family farm and use recipes that have been in the family for generations. El Avion Paprika- Papriki is a popular ingredient in Spain. It's used with vegetables, seafood paella and Chorizo. Or anything else. I think this is an underused spice in the US. Or maybe I've just been neglecting it? I've been paying a lot more attention to it and using it more often because it is so flavorful. Ines Rosales Cortadillo Citrus Crumble Cakes- A Cartadillo is a traditional Spanish pastry made with cinnamon and lemon. They're then filled with a cider cream. They're definitely crumbly! And tasty. El Almendro Turron- This is a popular holiday candy with crushed almonds and candied orange peel. 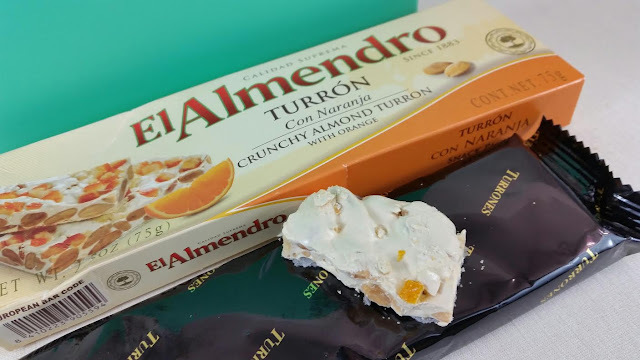 It's sort of like a crunchy nougat (or maybe I mean it *is* crunchy nougat) with the almonds and orange peel embedded in it and a thin wafer on the bottom. It's pretty crumbly but tastes SO good. So.good. VERDICT: I have to admit that I was expecting something for paella in here. I've travelled in Spain and it felt like no matter where you went there was some kind of paella dish available. Of course we were mainly in Barcelona and Tarragona so maybe it was just the part of Spain we were in. I'm glad there was a mix of savory and sweet but I do think that tuna is a strange inclusion. I actually wish it wasn't in there because I feel like it brings down the feel of the box. 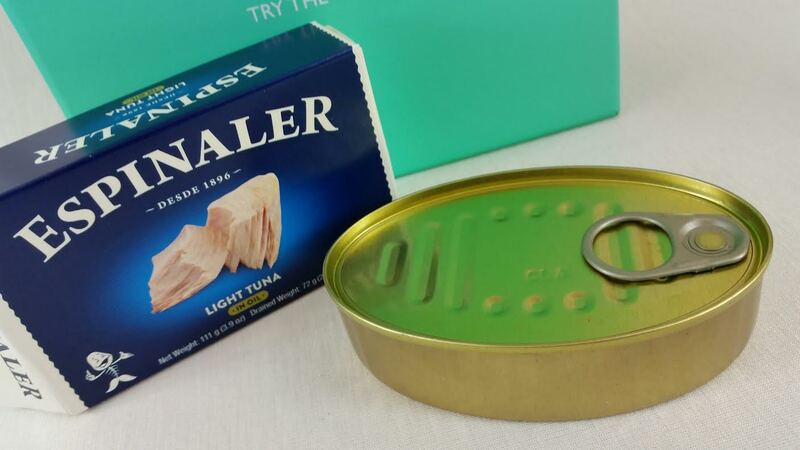 I can't imagine that most people would look at canned tuna and think "Oh, luxe special!" That doesn't mean I won't use it, though. I like tuna. Otherwise, everything I tried was tasty and all of it will be used in my house (I love to cook). 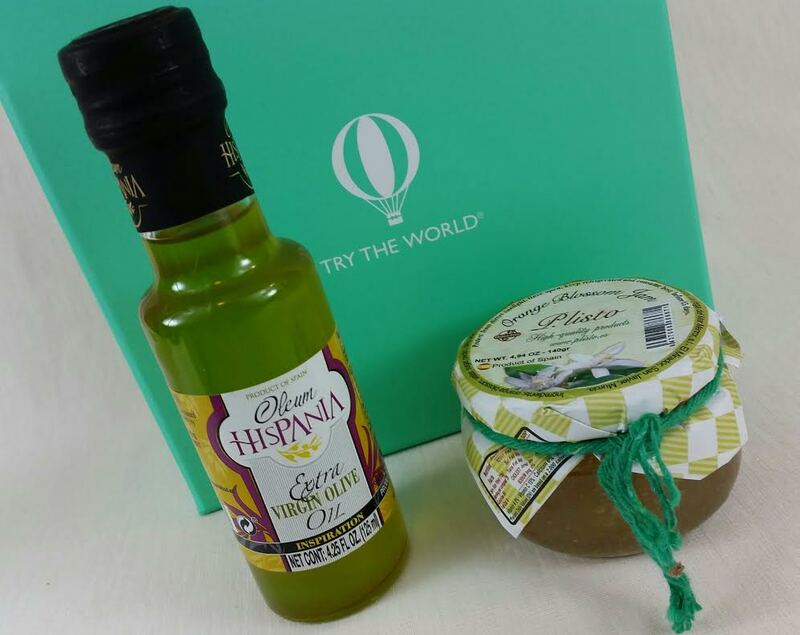 I do feel like this would be an excellent gift for foodies or those homesick for España. You can actually buy any of these products on the Try the World website so if you want to try one or two you can. If you would like to sign up for Try the World, you can sign up here. Use code bitsandboxes for 15% off. *This box was sent complimentary for review purposes. All opinions are mine (including ones about tuna). I had a 3 box sub to this and I was pretty disappointed for the price. For starters, their customer service is horrendous. I also found at least 25% of the items I received at Big Lots around the time I was subscribed, which led me to believe they weren't exactly getting these items from the highest end sources. 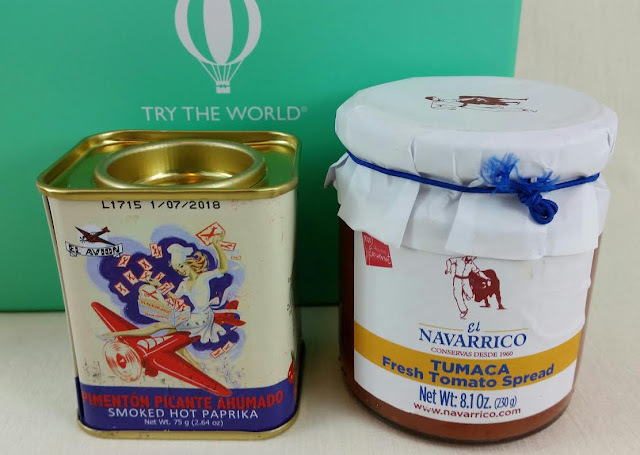 Specialty food boxes are always rough for value. I find they tend to equal the cost that's paid for it. The exception to that is Mantry which is $75 and routinely clocks in at about $50 (!!!). I'm not a huge fan of boxes like this because I'm such a picky eater but I have a few family members that would love getting something like this. I'm disappointed to hear that you have had a bad experience with customer service. It's so important to be responsive to your customer base. I've only been to Big Lots a few times but they do tend to have a strange selection of foods. Around here most of it is Mexican brands. I think half that things I find in most Japanese snack boxes could probably be purchased here if I looked hard enough, too. Hm. Yeah, the customer service basically made me promises that they dogs nothing to follow through on, and when I trotted top check in on it, they just stopped answering. My big problem was with the value they placed on their inclusions. One box had a small sleeve of cookies that they have a value of something like $7, but I found the exact same cookies at big lots, in a packet 4 times the size for $2. So, I'd say for the cost, Try The World comes in way under value. "Made me promises they did nothing to follow through on, and when I emailed to check up. .."
I'm sad to hear that. I get another box called OuiPlease and it has a perfume in it that (in France, anyway) is about $160 on French websites. But here? You can buy it for $30 online. /sigh I don't know why that is. At last oui please always sends a few truly high value pieces (unless you get a unlucky box)!